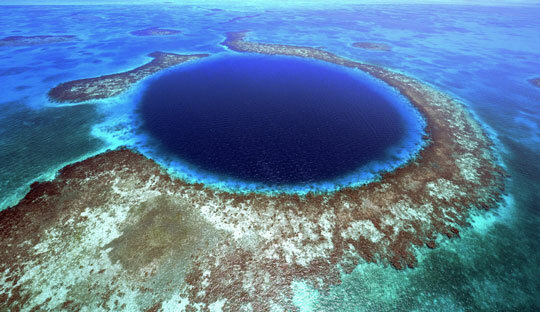 The Blue Hole of Belize, or The Great Blue Hole (as coined in the book "Ten Years Underwater" by British diver and author, Ned Middleton, 1988) is one of the most astonishing dive sites to be found anywhere on earth. It is unique in that it is the only blue hole that can be seen from space with the naked eye! Many earthly bound, influential men of our time have paid homage to Belize’s famous atoll. In 1836, Charles Darwin, world-renowned biologist-evolutionist, proclaimed the reef to be, "…the richest and most remarkable coral reefs in the western Caribbean". 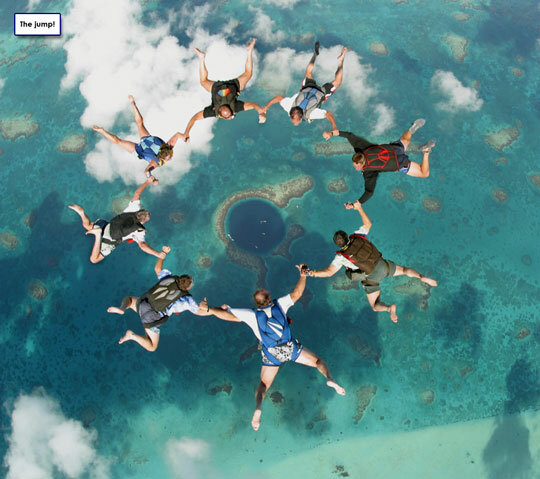 The Blue Hole is located in the center of the 27 miles (43 km) Lighthouse Reef, and about halfway between Half Moon Caye in the south and Northern Caye. This dive site is one of the furthest offshore, approximately 44 miles (70 km) due east of Ambergris Caye. Full day, 3 dive trips are available from resorts or one can enjoy the more leisurely pace when diving Lighthouse Reef and the Blue Hole from one of our recommended Belize liveaboards. 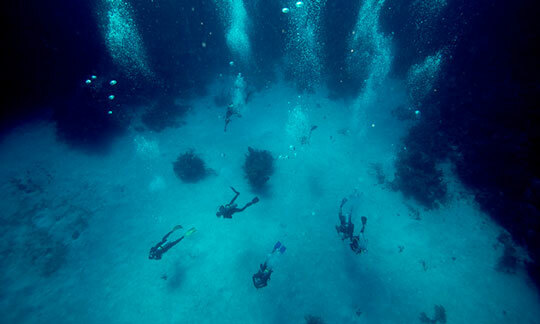 The area is protected from fishing as it is the centerpiece of The Blue Hole Natural Monument Marine Park. The hole is over over 980ft (300m) across at the rim and the Cambrian Foundation measured the hole’s depth at 406ft (124m) in 1997. The sapphire blue, spectacular circular site is only accessible by 2 narrow channels. Otherwise it is completely surrounded by coral reef. 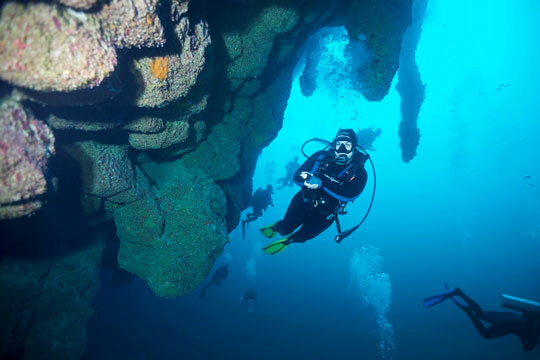 Diving the Blue Hole is for seasoned divers who wish to experience a completely unique, ‘bucket-list’ dive. The depth of the site requires good control over one’s buoyancy and a calmness when faced with little light at depth and a feeling of sensory deprivation due to very little change in water temperature or movement. The site can look imposing to even the most experienced divers so listen carefully to the briefing and stick close to your guide. Depending on weather conditions, the dive will begin on either the north or the south side. Staying reasonably close to the wall will assist with orientation. There is not much to see here in terms of wildlife - coral growth and therefore fish life is restricted by the lack of light that penetrates the Great Blue Hole. The walls are mainly covered in sea plants, feather-duster worms and algae, not with corals. 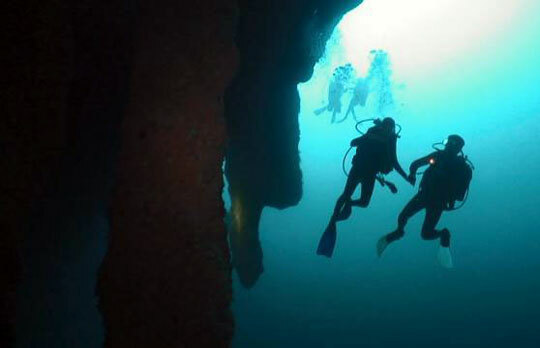 If you dive the south side, you will approach the shallowest cave systems at about 100ft (30m). You will notice that the angle of the wall changes, resulting in an overhang burdened with stalactites some of which are more than 3 feet in diameter and up to 20 feet in length. Fallen stalactites litter the lower ledge of the cave some 50ft (15m) below where stalagmites grow upwards like a set of rotten teeth as if to complete a grotesque subterranean shark's mouth. Below this is an entrance to a cavern system which adds an eerie feel to this already atmospheric dive. The north side is similar to the south with stalactite formations at 100-140ft (30-42m) deep but, unlike the south side, there is no lower ledge of stalagmites here, just the upper 'jaw' of stalactites hanging over the sunken karst abyss. The bottom is another 260+ft (80+m) below and very little exploration has been done down there; apparently it's just a large mound of sand and other fallen debris that has accumulated over the years. 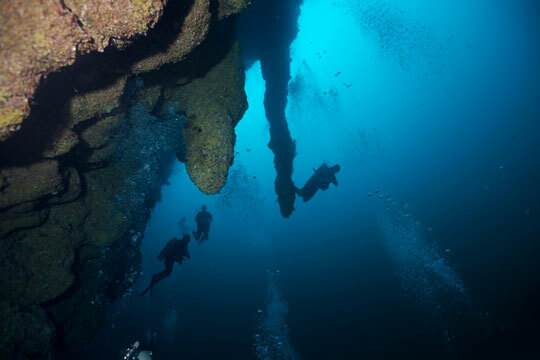 Once you have completed your brief tour of the rock formations and are heading back up, you may be greeted by the guardians of the Blue Hole in the form of Caribbean reef sharks and bull sharks that come barrelling out of the depths. The chances of seeing these creatures on a dive here is quite good. After a slow ascent you need to spend some time offloading some of the nitrogen absorbed during this deep dive and the coral reef that rims the hole is the best place to do that. Angelfish, butterflyfish and colorful groupers all inhabit the shallow coral gardens. Dozens of Pederson's cleaner shrimp and neon gobies advertise frantically from what seems like every coral head, trying to tempt you along with the passing fish to utilize their services. Back in the 1970’s Cousteau dubbed the Blue Hole as one of the world’s top 10 diving sites, moving forward to 2012 and Discovery Channel ranked the Great Blue Hole as number 1 on its list of "The 10 Most Amazing Places on Earth". Who are we to argue with the experts? 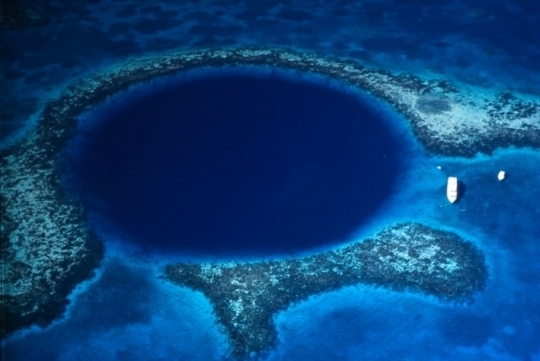 A truly memorable dive, the Great Blue Hole is a 'must' if you visit Belize. Most people associate the rise of the Blue Hole in diving circles with a certain French underwater explorer, however the famous site was featured in "Skin Diver" magazine in the 1960’s. Al Giddens both wrote articles for magazines and filmed the documentary "The painted reefs of British Honduras". Jacques Cousteau brought The Blue Hole to prominence in 1971. He navigated the site with his famous research and dive vessel Calypso. His visit naturally corresponded with the arrival of dive travel to the region. Canadian-Belizean diver Captain Ray, who accompanied Cousteau and his team during his exploration of The Blue Hole, compares diving the site from then to now. "Because of the relative isolation, our atolls have remained nearly as pristine as I remember them 30 years ago. As a result of today’s relatively easy travel, this sense of remoteness and the quality of the underwater environment is even more extraordinary. With only a few exceptions, I can visit any above or underwater site in the Belize atolls and the scene appears unaltered." 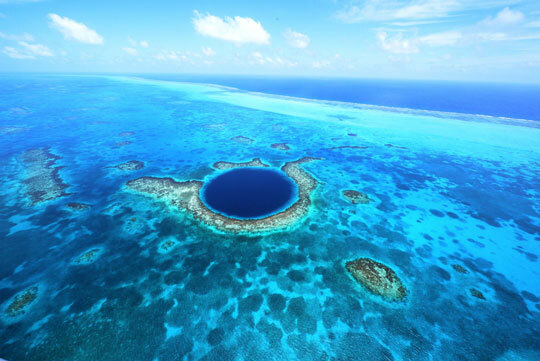 Conde Nast Traveler, awarded Belize's The Great Blue Hole first place for the most obviously named place in the world (tied with Australia’s Great Sandy Desert)! On a more serious note, the United Nations Educational, Scientific and Cultural Organization (UNESCO) describe the Belize Barrier Reef Reserve System (BBRRS) as "an outstanding natural system consisting of the largest barrier reef in the northern hemisphere, offshore atolls. Several hundred sand cays, mangrove forests, coastal lagoons and estuaries, the system’s 7 sites illustrate the evolutionary history of reef development and are a significant habitat for threatened species, including sea turtles, manatees and the American marine crocodile." 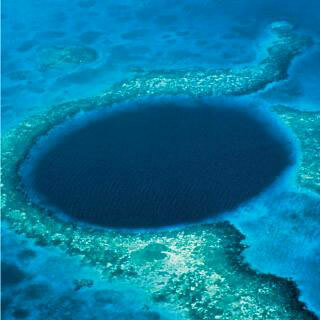 In 1996 the BBRRS, including the Blue Hole Natural Monument, was inscribed as a UNESCO World Heritage Site. This incredible natural wonder was created over an aeon during several periods of quaternary glaciation. Analysis of stalactites (proof that the hole originally formed on dry land) have revealed that the hole was created over several periods ranging from 153,000; 66,000 and 15,000 years ago. 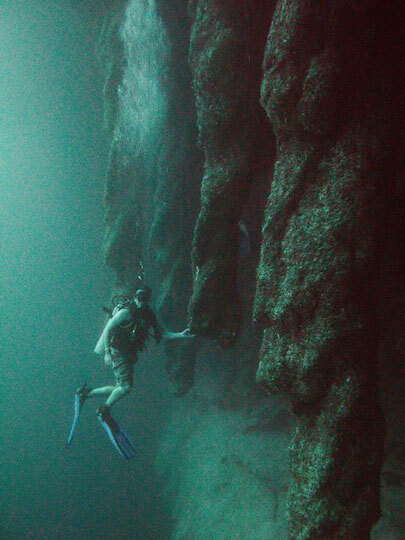 The stalactites formed when the sea levels were much lower and the Blue Hole was a cave system. As the oceans levels rose, glacial waters flowed through the limestone deposits of the then exposed Lighthouse Reef resulting in huge subterranean caverns. 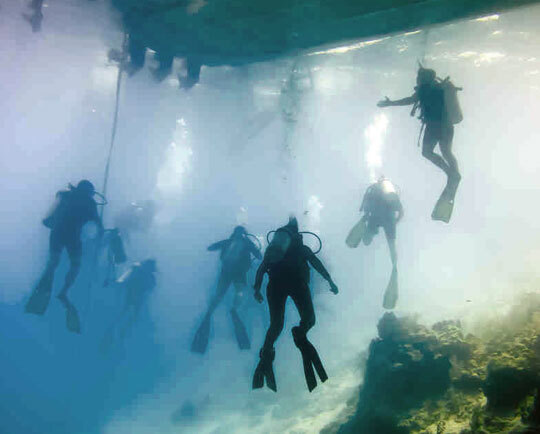 The roof of one of these caverns collapsed during a shift in the earth's crust, leaving behind Belize's most visually stunning spectacle and its most renowned dive site. The sudden decline of the mighty Mayan civilization is a frustrating puzzle for historians. The favored theory is that drought was the driving force (the Yucatan Peninsula lacks natural water reserves). This theory has been strengthened by samples from the Great Blue Hole that reveal lower than usual deposits of titanium around 800 AD. This is the same time that the Mayans abandoned their cities. How do these 2 facts relate to each other? Heavy rains erode titanium deposits in rocks into the sea. Low titanium levels indicate a log spell of unusually dry, hurricane-free weather. This unusual weather may have been catastrophic for the Mayan crops, forcing the great nation to abandon their magnificent cities.